Light winds are every kiters nightmare, you turn up to the beach, and there isn’t enough breeze to get your fix. 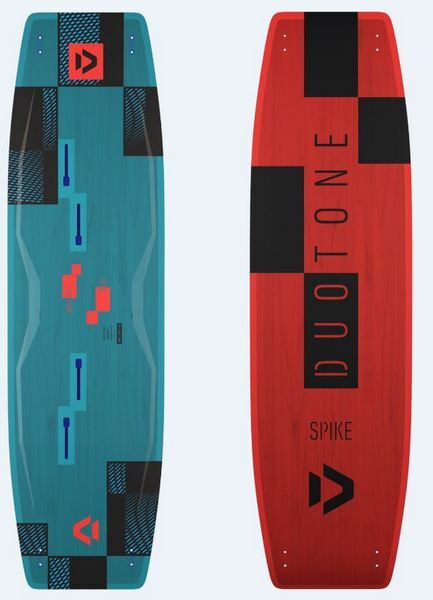 The new Spike turns those dull days into the fun days, thanks to its unique design and construction. The huge surface area will get you planing in the lightest of breezes while the flat rocker ensures plenty of speed. Because kiteboarding isn’t just about cruising we have packed plenty of pop into the Spike; the smaller sizes are slightly stiffer to offer improved freestyle performance, while the larger sizes have a little more flex to ensure a comfortable ride at speed. Don’t be disappointed next time you head to the beach, and the wind doesn’t show, have the Spike in your quiver and get out there! HUGE SURFACE AREA - A board is only early planing and a light wind weapon due to a huge surface area. It offers a great performance in lighter winds. MEDIUM TO HARD FLEX - combines competition performance with every day comfort. Precise adjusted materials offer control, power and comfort in just the right way to feel good in every condition. The Biax Fibre construction is used for the Duotone boards Gambler, Spike and Gonzales. These boards are produced with Biax Fibre for the best dampening and comfort. All of the pure freeride boards are produced with Biax Fibre for the best dampening and comfort. The new, rounder outline makes it fun in chop and the wider tip area helps to get going early. The straight outline is the reason for good pop and sharp edge grip. All of these boards are quite narrow which makes them fast and ensures the best upwind abilities.